Buffalo winters can do a number on our landscapes and properties. And Yard Barber Lawn Service LLC offers Spring & Fall Clean Ups. Lay down some healthy fertilizer. Fall clean ups ensures that your shrubs are pruned and ready for the cold winter months. Additionally your landscape beds are cleaned and fallen leaves are removed, preventing mold and fungus from growing. When you have shrubs around your home and in your landscaping, it is important to provide them with winter protection (winterizing) to ensure that they are not damaged over the winter months. 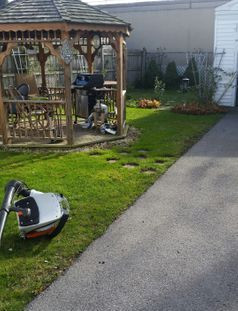 The shrub pruning service provided by Yard Barber Lawn Service LLC will assure that proper cutting methods are used and provide you with beautiful shrubs in the spring. Flower beds and landscape beds are beautiful and easy to maintain in the summer months. However in the fall, leaves from trees nearby or within the bed drop. As cooler weather arrives and rainy days increase, this can cause mold which can damage your mulch and plants and even affect your allergies. Bed cleaning also allows snow from the winter months to land directly on the bedding providing a direct water source for those warm spring days, helping your spring flowers to get the water and nutrients they need. 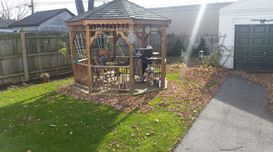 Leaf Removal can be a large task for property owners. Leaves fall from trees located on your property, as well as adjacent properties. While leaf blowers are an option, disposing of those collected leaves can be problematic. The leaf removal service from Yard Barber Lawn Service LLC takes the hassle out of leaf collection and removal from commercial and residential properties. Contact Us today to learn more about the leaf removal services.